We supply cork rolls for underlay and insulation in two densities, 180-190 kg/m3 (CR21) and 200-220 kg/m3 (CR30) in thicknesses between 2mm and 8mm, with a minimum order of one pallet. 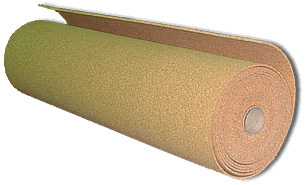 As well as providing thermal insulation and elasticity, cork roll also offers acoustic insulation and is hypoallergenic. We have two densities of cork roll available – the standard one is medium density, which is generally used for cork underlay. Whilst it is slightly brittle, when used as an underlay where it will generally be subject to only compression and not abrasion it is the right product. Our high density cork roll is better suited for decorative purposes or for making cork notice boards and similar; the product is more robust and is less prone to damage from regular handling. For insulation, you may also be interested in expanded cork boards.